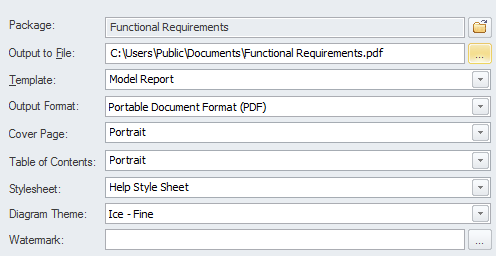 The documentation features can be used to automatically generate a wide range of documentation directly from the models. These can be document based such as PDF and Docx format or html based. Flexible templates can be used to completely tailor the documents that are generated including company logos, tables of content, tables of element information and diagrams. Ad-hoc reports can also be created from a number of tools such as the Glossary and the Search Window. Modelers, Analysts, Architects, Project managers and others can use the facility to produce a wide range of document based publications and reports, such as a: System Requirements Specification, Use Case Report, Data Dictionary, Solution Architecture Description and more. It can also be used for Ad-hoc reporting to create reports such as a list of the most volatile requirements. Html documentation can also be published to allow stakeholders who don't have access to Enterprise Architect to view the models from an Intranet site that can just be placed on a file system without the need for a Web Server. 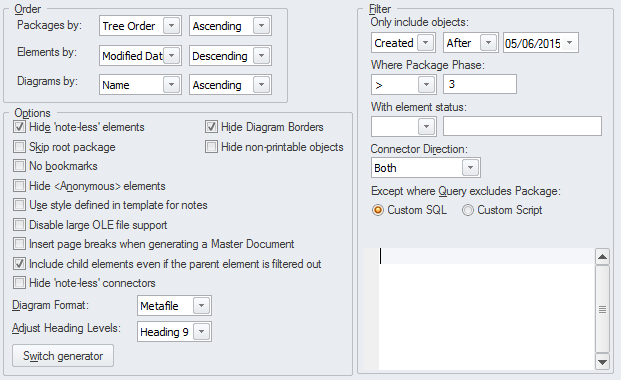 There are several options that can be set to tailor the information that is included in a generated document, including the ordering of elements and diagrams and hiding certain elements. Filters and word substitutions and other options can also be applied.